The cosmopolitan city of Hong Kong is an exciting blend of East and West with it's unique location on the edge of China. With a whole host of fascinating and vibrant attractions from traditional to ultra modern, Hong Kong appeals to visitors of all ages and nationalities. Hong Kong offers a host of attractions from the bright lights of the city to exquisite Victoria Harbour, ancient temples to lofty mountains and Colonial buildings to sandy beaches. Flights to Hong Kong operate from various airports. Direct flights to Hong Kong are usually preferable as travel times are quicker and you have more time to spend at your destination. You usually need to be quick off the mark to find the cheapest flights to Hong Kong as they tend to be snapped up quickly. The prices of flights to Hong Kong tend to rise closer to departure time and during peak travel times which are usually during the summer months and holiday seasons such as Easter and Christmas. We would advise booking your cheap flights to Hong Kong well in advance to get the best deals for travelling to this superb destination. Separating Hong Kong Island from Kowloon is the magnificent Victoria Harbour where you can take a ride on the Star Ferry, spend an afternoon cruising the waters or set sail in a traditional Chinese Junk. Explore Kowloon for cultural treasures such as the Sik Sik Yuen Wong Tai Sin Temple and the Kowloon Walled City Park or search for a bargain at the many stalls and markets including the famous Temple Street Night Market. Some people have concerns that by booking cheap flights to Hong Kong they will compromise on the quality of the airline they are travelling on or that their journey will be a lot longer due to more stops or changes of aircraft enroute. On the contrary, finding cheap Hong Kong flights may mean that you incur a couple of stops or transits but airlines frequently release fantastic flight deals so you can still find great offers on direct flights. Not only can you benefit from a cheap flight to Hong Kong but you will also have more money left over to spend on shopping, eating out or even to treat yourself to a room upgrade at your hotel. 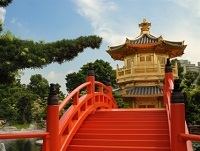 Directflights.com can help you find your cheap flight to Hong Kong just by clicking on any of the links below or using our flight search box. We list the cheapest flights to Hong Kong as well as all of the direct flights to Hong Kong. Even if you need to book a last minute flight ticket, Directflights.com will list a great selection of the cheapest flights to Hong Kong through the fantastic rates we get through our flight partners. The best way to get cheap flights to Hong Kong is to try and book in advance but airlines often release last minute offers at sale prices so you can still be lucky in securing an amazing deal. Hong Kong has a subtropical climate with seasons similar to those in the UK. The most popular time to visit is in the Autumn (September-November) when the temperatures are milder. In the height of summer, temperatures reach into the 30’s with very high humidity.